The Conference commenced with silent individual prayers followed by a statement welcoming delegates present. 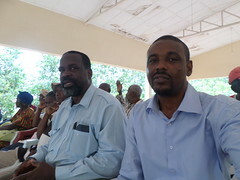 The chairman of program Joshua Abioseh Duncan, who is doubling as the Country facilitator of the Mental Health Leadership and Advocacy Program in Sierra Leone (mhLAP) as well as the Project Coordinator of the City of Rest wing of the Enabling Access to Mental Health in Sierra Leone (EAMHSL-CoR) emphasized that the third Mental Health Conference of the Mental Health Coalition – Sierra Leone was surely a memorable event as the content and outcome would have a lasting effect in the lives of all attendees. The deputy minister thanked the organizers, regretting the unavoidable absence of the Minister of Health, Madam Miatta Kargbo. Dr. Fofanah applauded the Coalition and partners for their ‘extraordinary commitment to a very important goal amidst the technical, financial and other demands.’ He pointed out that a sound mental state is not only central to the personal wellbeing of the individual, but also a condition for socio-economic development. The timing is critical, due to the residual post-conflict trauma, plus the distress of the global economic meltdown. He stated that the government of His Excellency Dr. Ernest Bai Koroma, wants people living with mental health challenges and organizations supporting them to know that they are not alone. The Minister encouraged the MH Coalition to press forward with their ambitious and forward looking agenda. Mr Carew expressed the Coalition’s pride to host the third successive conference. He said the 2014 theme of ‘Creating sustainable mental health systems in Sierra Leone’, is the most appropriate next step on how we can create Sustainable Mental Health Systems in our Country that would ensure access to good quality Mental Health service that will meet the need of all’. Such a system should be: Holistic, Culturally relevant and Sustainable. The Chairman underlined the need for government to take the driving seat and provide leadership and direction. He ended with a repeat of last Conference’s appeal to the Government through the Ministry of Health and Sanitation that the review of the current legislation called the ‘Lunacy act of 1902’ be given HIGH PRIORITY as it is KEY in protecting the rights of the service users and providers, thus contributing positively to the sustainability of any Mental Health system set up in country. 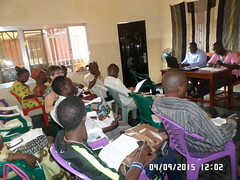 The Chairman stated that “We are all potential candidates of mental ill-health”. He spoke of adverse consequences if the nation’s mental health is not addressed, including Autism and other areas. He lamented that there are no schools where there are psychologists dealing with mental health issues. He warned, things could go worse if not addressed at this stage before children grow up. The minister emphasized that the theme is ambitious and that suitability is beyond just saying. Development activities should be designed taking into consideration mental health issues. He concluded with the following questions: Where are we now? Where do we intend going? What do we need to do to go where we intend? What measures have we put in place to go there? Research shows that mental health faces discrimination – therefore reordering of the social order is of uttermost importance, since mental health victims are also humans, robust efforts should be made to operationalize the theme. The Statement of the WHO Representative was read by Aminata Kobie who tendered Dr. Mufunda’s apologies for being unavoidably absent. He stated that people with mental and psychosocial disabilities are among the most marginalized groups in developing countries. Policies, laws and services in many countries reinforce human rights violations or fail to promote human rights. The burden of mental health is enormous. An estimated one in four people globally will experience a mental health condition in their lifetime. Mental health conditions are responsible for a great deal of mortality and disability, accounting for 8.8% and 16.6% of the total burden of disease due to health conditions in low and middle income countries, respectively. He informed all that WHO is committed to supporting the improvement in mental health. The West Africa Medical Mission team made a drama presentation on the effect of discriminating and stigmatizing against the mentally ill and possible means of addressing these challenges. Prof. Joop de Jong’s presentation is titled: “Public Mental Health as the royal road to sustainable mental health coverage”. He defined Public mental health as ‘the discipline, the practice and the systematic social actions that protect, promote and restore the mental health of a population’. The three sustainability keys are: protect, promote and restore. For sustainability, we must learn to thinkPublic Health. He highlighted the common tendency to ‘always want to treat (restore individuals), rather than prevent (protect Communities). Appreciating the mhGAP Intervention Guide launched by the WHO in 2010, he recommended that the Guide needed ‘cultural adaptation and long-term implementation. The PMH model accommodates a variety of preventive and curative interventions. Theme 2: Holistic – Conceptual Presentation was done by Dr. Carmen Valle with Co Presenters on Holistic Case study by Concern World Wide. Yoga Exercise: – T-man and Tamsin had delegates do some yoga exercise which added the desired flavor to the entire program. 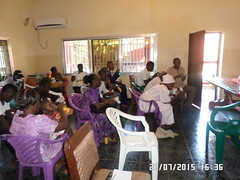 The participants also benefited from tea-break and lunch as well as break-in-group sessions.